This post comes from David, our Graduate Trainee Library Assistant. Each year, our teams visit a few other collections to learn about how they work and what material they offer. With just three weeks under my belt, I felt very fortunate to go on the staff trip to Bristol at the end of November. Although my Grandparents live in Ashton Vale and I have visited them often I had never really been to the centre of the city before. 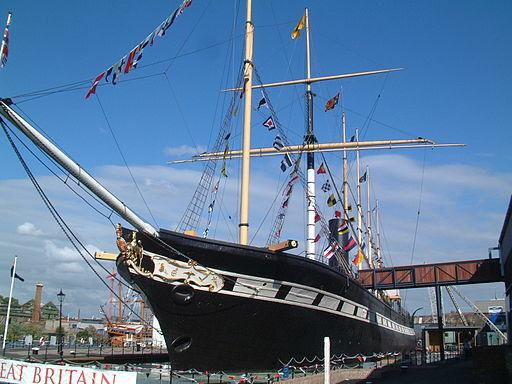 So it was with great anticipation that I met up with everyone outside the SS Great Britain. After a look round the gift shop, we were taken into the David MacGregor Library of the Brunel Institute where archive staff member Verity’s sister, Rhian, introduced us to their collections. Highlights included Brunel’s very own penknife, sketches of the ship and early design ideas for the Clifton Suspension Bridge with a pagoda in the middle! There was also a peepshow of the London tunnel (the collection had 12 in total), like Special Collections’ own from the Great Exhibition Collection. Their archive store was much smaller than ours but all the objects, paintings and papers were packed in neatly. I was surprised that there was no dedicated librarian but what they lacked in staff numbers they made up for in access. The conservators work behind glass panels so people can see them at work during their Conservation in Action sessions and they deal with over 100 volunteers. Another idea that we thought was possibly worth doing at MERL or Special Collections in the future was Archive in Five, a regular session in which a particular item is put on display and its story is explained to the public. 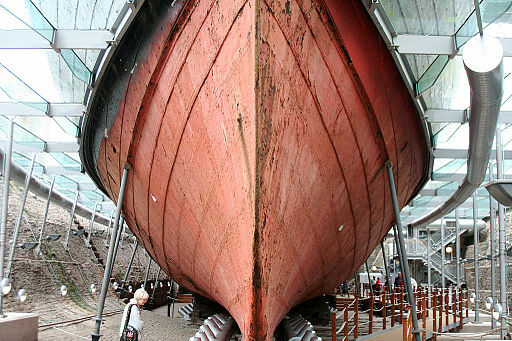 On first approaching the SS Great Britain you get some idea of its size but it’s only when you walk around it that the scale truly sinks in. Very cleverly the ship is preserved in dry dock in a humidified zone and you can go below the water level and fully see the hull, propeller and anchor. From the top deck down the ship has been refurbished to its mid-nineteenth century heyday (including class distinctions)! The promenade and dining saloons give an idea of the grandeur of travel for first class passengers at the time (as well as providing workspace for educational visits), while the steerage and galley sections show how the other half sailed. The accompanying Dockyard Museum was also atmospheric and informative; covering the ship’s origins, its 30 years carrying migrants to Australia, its return to Bristol and much more. You could have a go on the fog-horn too! The second part of the trip was at Bristol University Special Collections but due to the bad traffic (clearly one reason I’d never made it to the centre before), we were only there for half an hour. Still, the staff there were very welcoming and showed us some highlights from their rare books including architectural and early medical texts (though we’d seen Vesalius before) and National Liberal Club Pamphlets. In the safe there was a fine Book of Hours like our own and the papers of Bristol University’s founders, the Wills and Fry families, who in some respects couldn’t have been more different. The former made their fortune from tobacco plantations while the latter were leading chocolate manufacturers and Quakers. Lastly, we had a quick look at the Penguin archive which is one publisher that managed to escape Reading’s collections. All in all, to quote Bristol’s very own Wallace and Gromit, it was a grand day out!